“Nectar” (2015) by Dominic Pangborn. 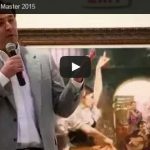 As spring showers inspire flowers to grow, Park West Gallery asked Korean-born artist Dominic Pangborn to speak about the meaning and symbolism behind the flowers that bloom from his artwork. Poppies are a favorite subject among artists and art collectors alike, and Pangborn is no exception. He says even if people have never seen a poppy in real life, the late-spring flower in his art seems to draw them in. 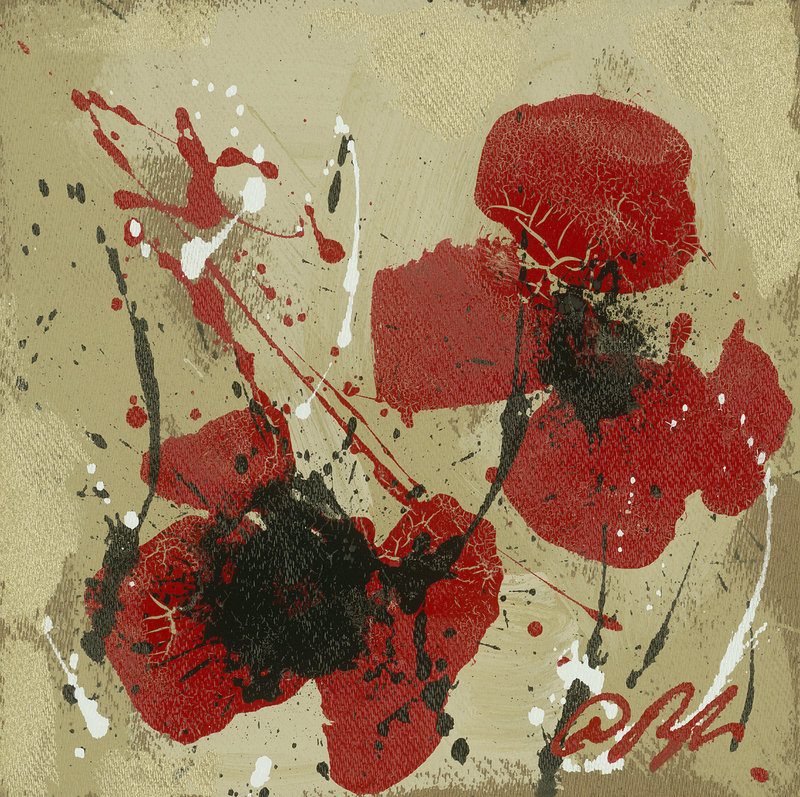 In addition, red is a recurring color in Pangborn’s oeuvre, making the poppy a natural choice for the Detroit-based artist. In works such as “Sunrise Poppies” or “In Bloom I,” Pangborn says he paints his bright poppies using negative space to engage the viewer, making them think and ask themselves what they see. 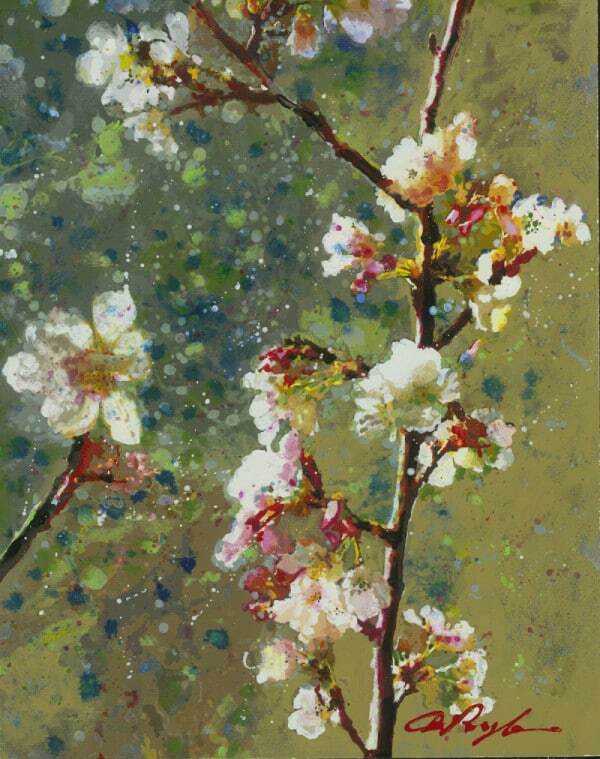 “In Bloom I” (2013) by Dominic Pangborn. 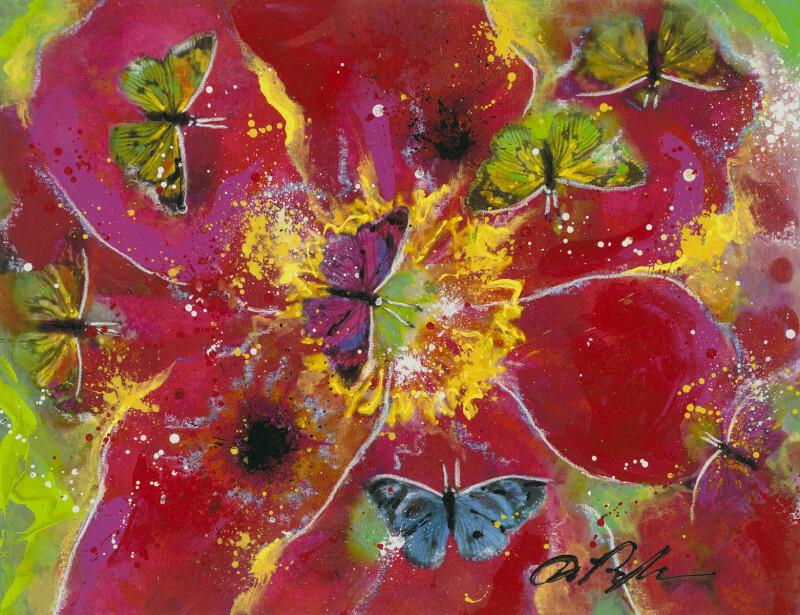 In “Nectar,” Pangborn paints an abstract close-up of a poppy with colorful butterflies fluttering around it. His penchant for using asymmetry is apparent in “Nectar,” painting an odd number of petals and butterflies. He says to him, asymmetry represents the organic, natural world. This philosophy is partly inspired by his heritage and his travels. For instance, his observation of ikebana – the Japanese art of flower arrangement symbolizing nature and humanity coming together – has played a role in his floral paintings. Butterflies in his artwork symbolize transformation, a theme not only appropriate for the changing of seasons, but one Pangborn sees in himself, as he seeks artistic evolution through revolution. 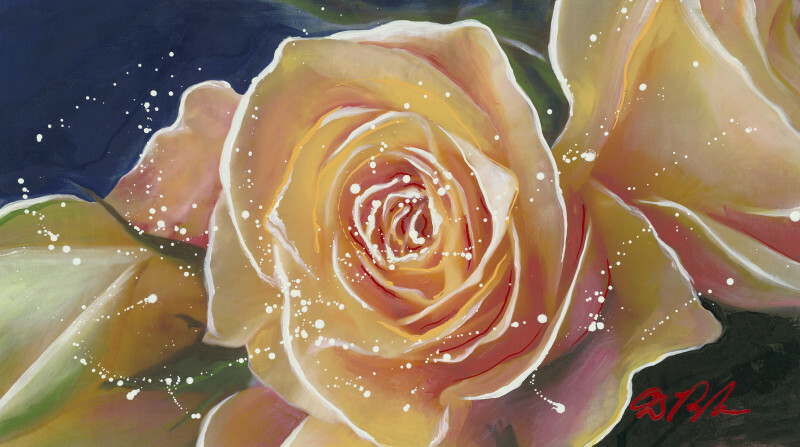 “Peach Rose” (2015) by Dominic Pangborn. 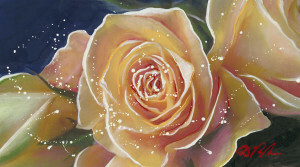 While his art usually involves abstraction, Pangborn will also create representational paintings like his “Peach Rose.” This photo-realistic style shows his versatility, and still includes abstraction and expressionism in the form of paint splatters accenting the rose. “I know that every painting I do has emotion put into it, and I really believe that emotion jumps off onto the viewer and they have that feeling,” he says. i love his work. I would like to know the. Price on April Showers. Hi Julia, A sales representative will contact you shortly with more details! Thank you! I think Pangborn is a outstanding artist. I love his work. I have a few of his lithographs and love them. He does Beautiful work. I too would like to know the price of this print as well. Print only no framing. Hi Angela, A sales team member will contact you today! I don’t see Nectar in the on-line catalog. Is it being offered yet? Hi William, Yes Nectar is currently available. 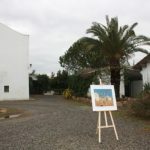 Sorry for the confusion, we only display a small selection of works by each artist on our website. I love his work. He is still my favorite artist! Always changing.. keep it up. Love you, Aloha from Hawaii. I’m a Pangborn fan. Love his work. Great colors and subjects. You’ll end up staring at it for a long time, letting you enjoy all colors and strokes one at a time. It’s always an amazing experience looking at Pangborn’s piece of art. Just left a VIP event in Galveston Texas and had the pleasure of spending time with Dominic and we love him and his work.